In addition to All Cheese Baskets, Cheese and Crackers Baskets and Meat and Cheese Gift Baskets, the gift baskets below include a different assortment of a variety of gourmet foods including Wine, Cheese Spreads, Summer Sausage, Snack Sticks, Mustard, Jam or Cheese Curds. Can't decide? 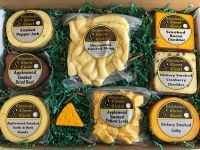 Our retail Gift Cards and Electronic Gift Certificates let people choose THEIR favorite Ehlenbach's Cheese Chalet products ... and our Electronic Gift Certificates can be ordered and delivered INSTANTLY! Even on Christmas morning!! Service Area: Madison, Sun Prairie, Janesville, Baraboo, Green Bay, Racine, Hartland, La Crosse, De Forest, New Berlin, Stevens Point and surrounding WI communities.